Bio: Kitty Mae Stamps Wirtz was born January 18, 1888 in Seguin, Texas. She married Alvin Jacob Wirtz on November 18, 1913, and they had one daughter. Alvin Wirtz served as a member of the Texas Senate from 1922 to 1930, and he advocated the formation of the Lower Colorado River Authority. Alvin Wirtz also served as Under Secretary of the Interior from 1940 to 1942. 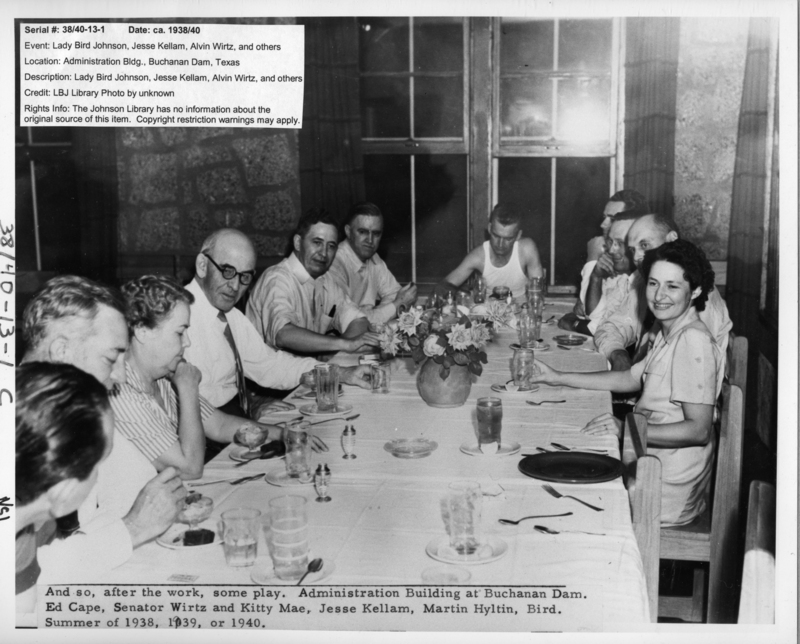 Lady Bird Johnson, Jesse Kellam, Alvin Wirtz, Kitty Mae Wirtz, Ed Cape and others. Administration Bldg. Buchanan Dam, Texas, 1938-1940. Photo # 38/40-13-1 by unknown.Pre-Presidential Photo Collection, LBJ Presidential Library. No source information available: copyright restrictions may apply.